The Pro 1000 is not a brush that has been officially launched in the UK, which means that if you do find it available on places sites such as Amazon it tends to come at a premium because it has been imported. This makes the Pro 2 2000 an obvious winner because for slightly better features, you are paying a lot less. The closest equivalent to the 1000 in the UK is the Pro 600. Therefore, if you’re looking to compare the Pro 2 2000 to the next cheapest brush, see our Pro 600 vs Pro 2 2000 post, in which we also rate the 2 2000 as the winner. If you’re shopping specifically within this price range you want to consider our choice for best budget toothbrush. The Pro 2 2000 has 2 cleaning modes (Daily Clean & Gum Care) compared to the 1 mode (Daily Clean) on the Pro 1000. The Pro 2 2000 has a more powerful motor. The Pro 2 2000 has a Lithium-Ion battery offering 2 weeks battery life compared to the Nickel Metal Hydride in the 1000, that offers just 7 days. The Pro 2 2000 has a pressure sensor that the Pro 1000 does not. The Pro 1000 is available in 2 different colour options White/White and Black/White. The Pro 2 2000 is available in Blue/White and Pink/White. The Pro 1000 comes with a CrossAction brush head whereas the Pro 2 2000 is offered with a CrossAction, 3D White or Sensitive brush head. The Pro 1000 is not a brush that has been officially launched within the UK. It has been sold primarily in the USA and select other countries around the world. The UK equivalent is the Pro 600. The only difference between the 600 and the 1000 is the colours and the charger that comes supplied in the box. Despite the Pro 1000 not being a brush for the UK market, we have received requests for a comparison between these two models hence this article. The Pro 2 2000 is a replacement to the Pro 2000, note the extra 2 in the product name for the newer model. The only notable difference between the older model and 2017’s model is the battery. The older NiMH battery has been replaced with Li-Ion, doubling the battery life. The 1000 has not been updated. 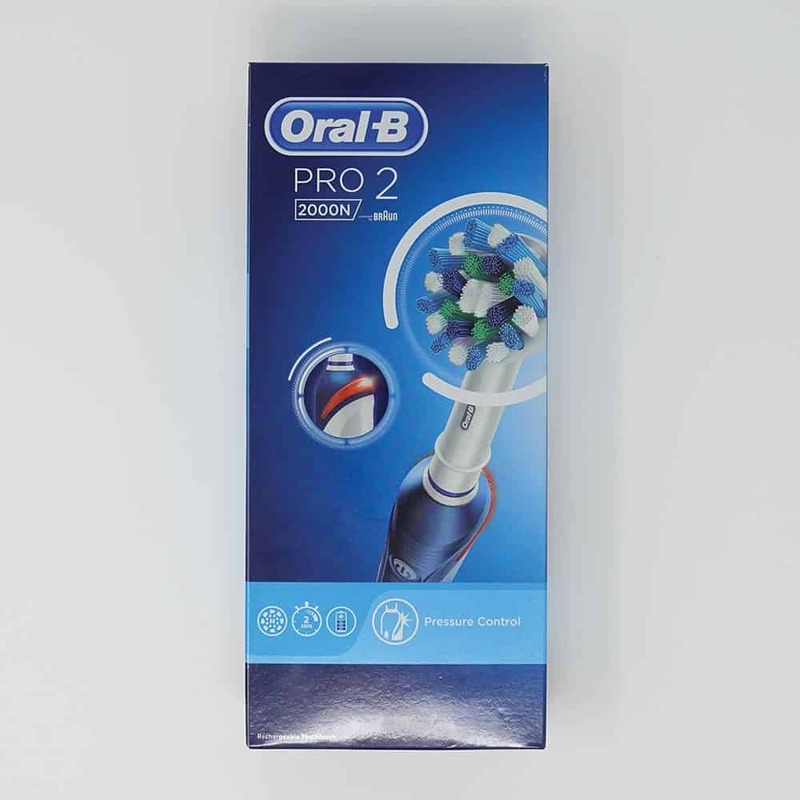 Detailed Comparison: What’s the difference between the Oral-B Pro 1000 and Pro 2 2000? These 2 brushes fall at the lower end of the electric toothbrush range from Oral-B, but they offer most of what you need of an electric toothbrush at a good price point. The Pro 1000 (or Pro 600 as a UK equivalent) is one of the best budget brushes available today. So let us show you in a bit more detail how these two brushes differ and why we came to the conclusions we have. Both brushes have a Daily Clean mode, this is the default cleaning mode available on all Oral-B brushes, but where the 1000 has just that 1 mode, the 2000 has an extra mode known as Gum Care. Gum Care is a slower and softer modes, best suited to those with sore, tender bleeding gums that will over time stimulate blood flow and better health in the tissue. This mode works well when paired with a Sensitive brush head. Both modes last for 2 minutes, the dentist recommended cleaning time. Unless you have the two brushes side by side, and even then it’s virtually impossible to tell, the motor in the handle of the Pro 2 2000 is actually the more powerful. The number of movements offered per minute from the 2000 is greater than the 1000. 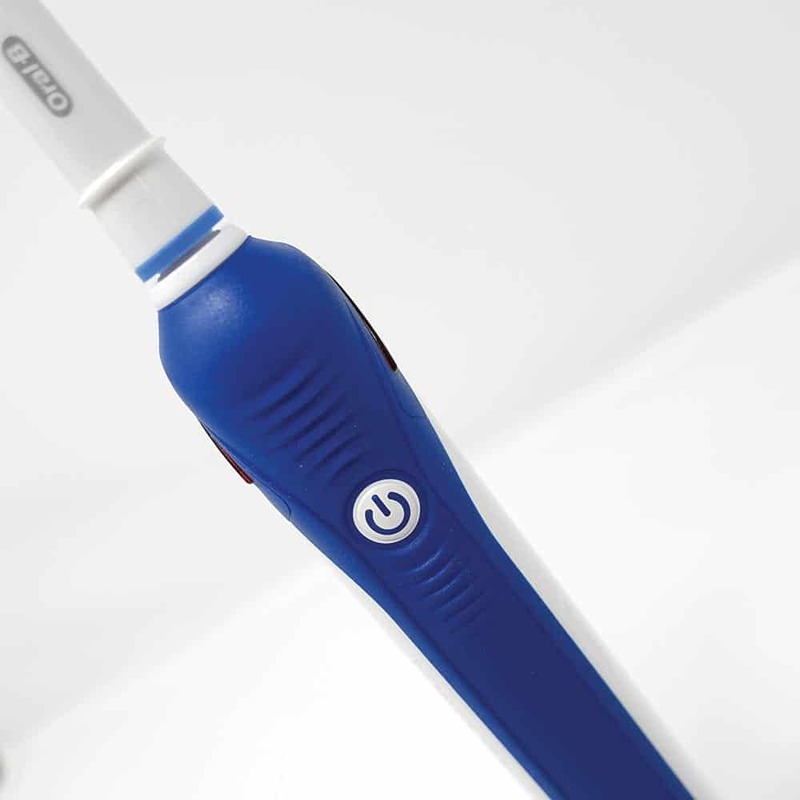 The 1000 is still a significant improvement to your oral health over a manual brush, but long term the 2000 could just give a bit more edge and make your dentist very happy. Another bigger difference is the batteries within the brush handles. Both have a battery built into the handle, the Pro 1000 a Nickel Metal Hydride (NiMH) battery and the Pro 2 2000 a Lithium-Ion (Li-Ion). The 1000 offers up to 7 days battery life or 28 minutes of brushing timer. The Pro 2 2000 offers at least double that at 2 weeks. In fact our hands on testing achieved 16 days or 64 minutes of brushing time. Using this newer technology means less frequent charging and it also means that the battery should last longer too, giving you a longer ownership period. Built into the Pro 2 2000 is a visible pressure sensor. When the brush detects that too much force is being used when brushing, it will not only slow the motor to reduce damage it will activate a Red LED on the neck of the brush. The light will go out when the pressure is reduced. At the same time the motor will power up again. Brushing your teeth with too much pressure can be damaging to the teeth and gums, it can cause gum recession. Bristles need only skim the tooth and gum surface, it does not need to scrub hard. The 1000’s motor will reduce the power when too much pressure is detected, but it has not LED to alert you, you need to listen out for any change in motor speed/sound. You will only hear this if you alter the pressure you apply, it will be a slight but noticeable sound difference. A pressure sensor is very useful, particularly for new electric toothbrush users, but after a short while you do get used to the amount of pressure you need apply. The brush handles are made from a gloss White plastic, but both have a rubber grip running down the front of the brush handle. Black or White in colour on the Pro 1000, this same rubber grip is either Blue or Pink on the Pro 2 2000. To complicate matters slightly, the Pink colour variant of the 2 2000 comes supplied normally with the 3D White brush head. The Blue Pro 2 2000 comes with either a CrossAction or a Sensitive brush head. The 1000 on the other hand comes only with a CrossAction head. Both brush handles come supplied with a single brush head in the box. Whilst it would be nice to buy a Pink handled Pro 2 2000 with a CrossAction brush head, this is not normally how they come packaged; but of course the head can be changed, because the brush heads are interchangeable and can be purchased separately. Both brushes come with a 2 year warranty, are water resistant, have a built in timer and come with a charging stand. Technically, the more powerful motor found in the Pro 2 2000 means more movements in the brush head and the ability to clean better than the Pro 1000. However, in reality, being able to see or feel the differences are virtually impossible unless under laboratory conditions. Perhaps long term the benefits and effects of the more powerful motor are noticeable, so for peace of mind there is an appeal here. The extra cleaning mode on the 2000 will mean for some it cleans better as the slower movements will better suit those with tender teeth and gums that cannot handle the more powerful Daily Clean mode. Another slight catch to this is that the results may differ depending on the brush heads used. As we explained different ones come supplied, but all the Oral-B heads are interchangeable and can be used on different models. Certain heads may achieve better results in certain circumstances for certain individuals. Using the smaller round brush heads that Oral-B promote you can get a fantastic clean and they will all remove more plaque than a manual toothbrush leaving your mouth cleaner and fresher than before. Normally the Pro 1000 is cheaper. This is slightly more difficult to say/comment on as the 1000 is not a UK model, and if imported from the USA would work out to be the same price as the 2000. However, if you look at the price of the 600 (the 1000’s UK equivalent) there is about £15-£20 difference on average. At the time of writing the Pro 600 is being sold for £19.95 compared to the £34.98 for the Pro 2 2000. The Pro 2 2000 is the one to go for unless you are on a really strict budget. The extra power, better battery life, cleaning mode and pressure sensor make it worth the investment, it is not a brush you will be disappointed by and it without doubt one of the most popular brushes available today. Slim and lightweight, offering a good clean and an array of features and interchangeable heads, it is a superb electric toothbrush that will improve your oral health and could long term reduce your dental bills!